” Celebrating world flavors” event showcases food service corporation “Sodexo” partnerships with culinary organizations and renowned chefs from around the world. 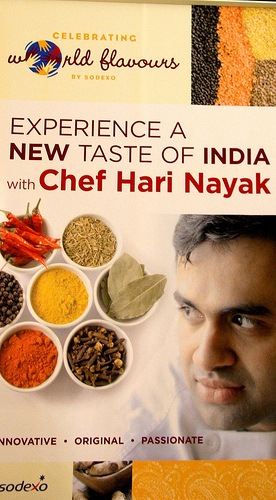 To kick of this series chef Hari Nayak was invited as the first international chef to educate the students in various diverse/ ethnic cuisines and engage them in culinary demos/ lectures on food. The 2 week event was held during Nov 10th – Nov 21st to celebrate and educate the flavors and the diverse cuisine of India. The series will continue in the future with renowned celebrity chefs like Micheal Smith, Ming Tsai and Rick Bayless.